Up on a mountain, glowing orange against a sea of green trees is Kiyomizu-dera. To get to Kiyomizu-dera, you begin with a ten-minute hike uphill along Higashiyama. Dan wasn't up for the task after an entire day of shrine hopping and instead opted to take up residence at a local craft beer pub at the base of Higashiyama. Japan isn't known for their craft beers, but this one little bespoke shop sells beers from local breweries around Kyoto. The walk up Higashiyama is part of the entire experience of Kiyomizu-dera. These shops along the route have, for hundreds of years, served pilgrims who came to pray at the shrine. These shops and restaurants carry local specialities, pottery, souvenirs, handmade crafts and street food. A favoured treat to get is the Nama Yatsuhashi. This dessert is made from mochi pounded into a flat dough with a sweet filling sandwiched between and shaped into a triangle. The fillings include bean paste, strawberry, blueberry and green tea. One of the few treats that are safe for those who have Celiac disease or who are gluten intolerant. Fan shops along the street sell traditionally made Japanese fans from local artisans, the perfect piece of decor to take home that's easy to pack! Reaching the top of Higashiyama, you can look down at all the store fronts from above. These buildings are ancient and look like they've stood in the same place since the construction of the temple. Although the hordes of tourists, Pokemon t-shirts and Hello Kitty hats might take you out of the historical mindset, don't let that spoil the experience for you. Focus on the ancient signage, the cracked old roofs and kind faces of women who've served travellers for ages. The first thing you see upon the accession of the hill are the bright green bushes surrounding the base of the temple. Many women dressed in stunning kimonos stand here, posing as their families take their pictures. The giant "Niō-mon" gate greet you as you walk up the stairs. The gate was originally built in the late 15th century but refurbished in 2003. On either side of the gate are two massive wooden warriors behind the green lattice. These soldiers are called "Nio" (the two kings), and the gate is named after them. As you walk up the stairs, you will also pass two Lion dogs who also serve as guardians of the temple. Passing through the gate, you come upon the grounds of the temple. 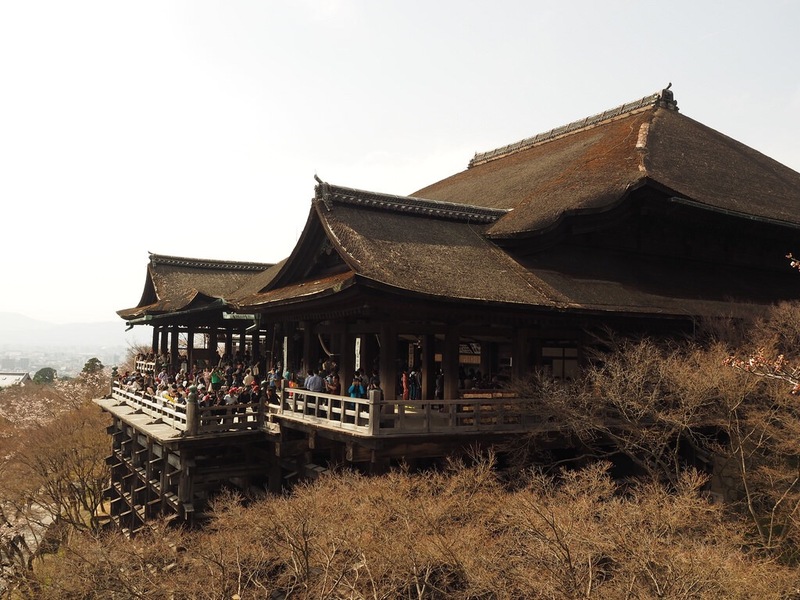 Kiyomizu-dera was founded in 778 on this site but most of the buildings you see today were constructed in 1633. In 1994, the temple was added to the list of UNESCO world heritage sites. The name "Kiyomizu-dera" comes from the waterfall which flows through the grounds. "Kiyoi mizu" means pure water. The waterfall trickles down from the mountains and breaks off into three separate streams here at the shrine. Each one of the streams is known to endow the drinker with a particular benefit; life longevity, success at school or a fortunate love life. Long polls with cups attached to the end are provided for people to drink the water. It is thought to be greedy to drink from all three, and one must choose their greatest desire and drink only that one stream. At the top of the stairs lies the Vermillion, three-storied Koyasu Pagoda. Visitors who come to the pagoda and pray here are thought to be brought a comfortable and safe childbirth from the gods. Beside the Pagoda, you can also see the "Shoro" (belfry) with a time-worn bell that was cast in 1478. The brilliant paint on all the structures is so impressive, and one can only imagine the awe it would instil on the viewer coming here in the Edo period. The Main Hall is the biggest draw of the temple. The hall was built without a single nail and whose wooden veranda juts out 13 meters over the forest with a view of the city below that is unrivalled. Getting into the Hall is an extra entrance free but worth the small cost to see such a view. When the sun goes down, this is one of the best times to be as the silhouettes cast on the city by the setting sun is spectacular. In Kyoto, there is an expression which says "to jump off the stage at Kiyomizu". Which is like the English phrase "to take the plunge". In the Edo period, people would jump the 13 meters from the veranda to the ground and if they survived their wish granted by the gods as a gift for their bravery. Surprisingly enough, 85% of the people who jumped survived but the practice is banned today. Behind the main hall, we can find the Zuigudo Hall. This, somewhat spooky building, is dedicated to Buddha's mother. Inside you must wander through a pitch black basement which is thought to symbolise the womb. 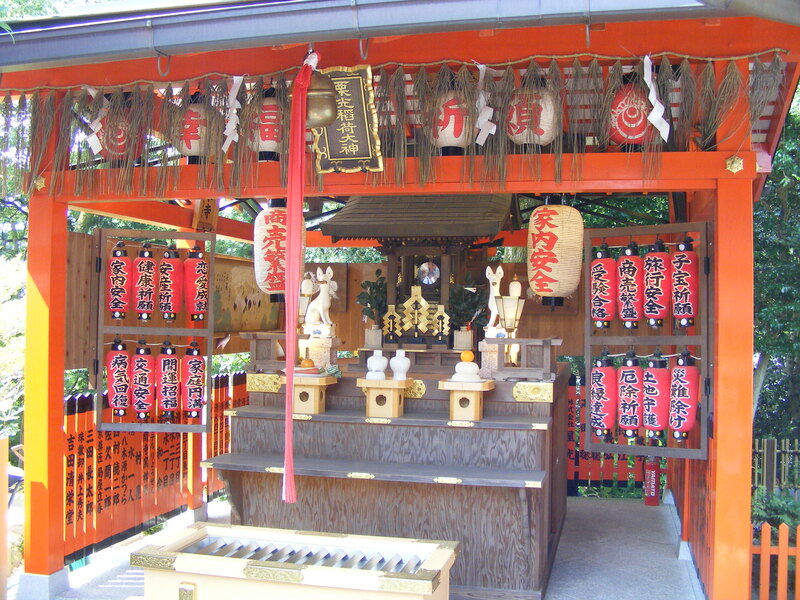 Behind Kiyomizu-dera you will find an equally famous spot, the Jishu Shrine. This shrine is dedicated to the deity of love and matching making, and so singletons from the world over will come here to pray for their true love. 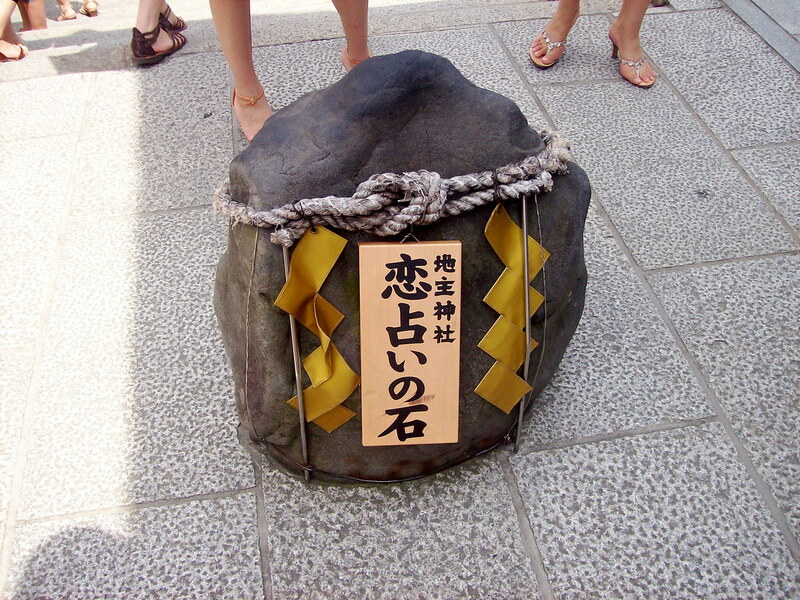 In front of the shrine, there are two large stones placed 18 meters apart. The person looking for love is blindfolded and must walk from one stone to the other. If you need help finding the other stone that is supposed to mean you will need help from someone else to find your true love in your future life. One of the smaller hall towards the back is dedicated to the Shaka Buddha and surrounding the perimeter of the exterior are over 200 stone statues of Jizo, the protector of children and travellers. Just wandering through the temple is a transcending experience. The bright colours of the buildings and the even brighter coloured kimonos worn by female visitors make the entire space feel like a moving art gallery. There was nothing like being up here as the sun began to set and getting to see the city from high above. Although it's a bit of a trek and the number of tourists might seem daunting, this is truly one of the most spectacular sights in Kyoto. When there are so many temples and shrines to see, it's often difficult to know which ones are worth seeing, but this one is easily one of the best.